Living in a Historic thatch… Are you on somebody’s list? 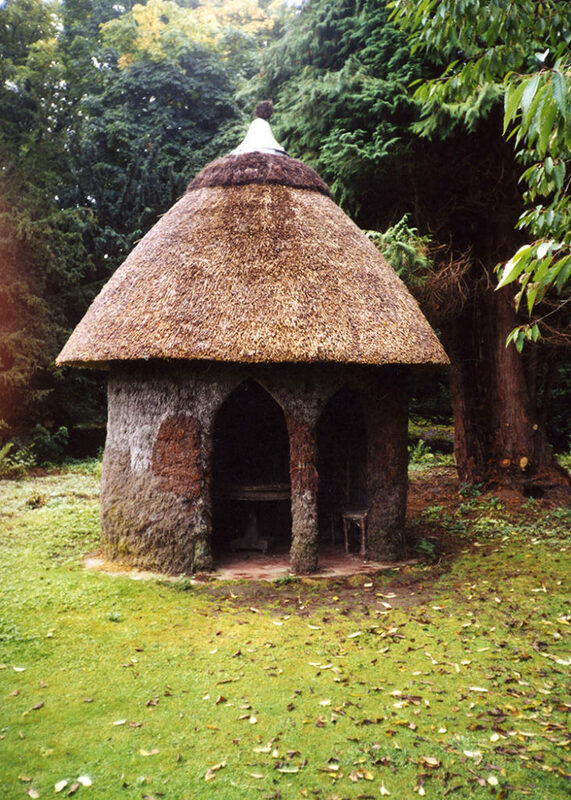 An ‘A’ category listed thatch, tucked away at Tranquair House in Peeblesshire. Built in 1834, with walls of heather. Now with a jolly ridge of the same material… ‘Listing’ applies to buildings both great and small. With the force the of law to protect them. Photo; courtesy Tranquair House. So much for the scary stuff… The main point for any thatchowner to remember is that only altering the building requires permission. Keeping things as they are, does not… So replacing the thatch, with similar materials in a similar style, should not ruffle any official feathers. And being listed doesn’t mean you can’t change anything; only that you have obtain permission, to carry out alterations. controversy, when owners have tried to change the type of thatch, on their property… Especially a move from long straw to water reed. There are quite a few misconceptions, about the validity of changing from one material to another… Which are examined below. 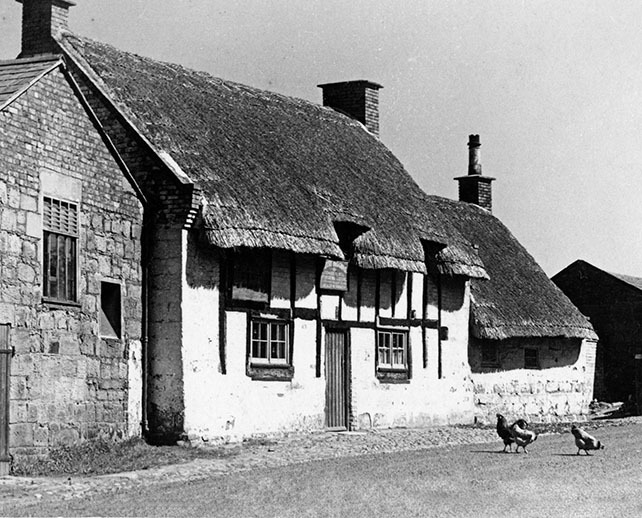 Changes… An old image of ‘The Wheatsheaf Inn‘, in around 1930. And a new one of ‘The Harvester’; at Raby, just across the River Mersey from Liverpool… They are of course the same pub. Both the name and the type of thatch having changed. The passing years have seen the multilayered ,long straw roof, being stripped and replaced; by a single layered coat of water reed. Both perfectly legitimate forms of the craft. But giving quite a different look to a building… Which is what a local conservation department, is so often worried about. Another argument, used in favour of water reed, is that it is easy to obtain throughout the year; this is true. Even with a good harvest, there is simply not enough wheat straw grown, for thatching; to supply all the demands of the craft. And when there is a bad harvest, the position quickly becomes critical. Native resources of water reed, are not sufficient to supplement a shortage of wheat straw… It has been the ever increasing supplies of imported reed, that have allowed the industry to grow. The only answer to this, is for more farmers to diversify and grow thatching wheat. But even that, cannot lift the spectre of a poor harvest. 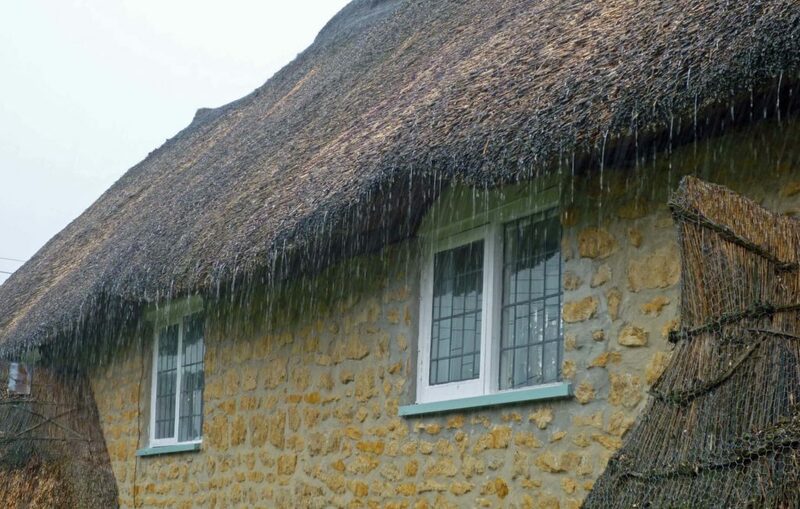 Thatchers like the steady supply of water reed; and it is much easier to use, especially on timbers. As has been shown, stripping the old roof often changes the shape of the thatch… And can lead to conflict with the conservation department. But when dealing with a change, from combed wheat reed to water reed, this does not have to be the case… Over the years, as many thatchers first came into contact with the material, originally Norfolk reed from the Broads; an idea has come to be accepted. That the only way to thatch with water reed, is to use the methods employed in Norfolk… Which of course are perfectly acceptable. 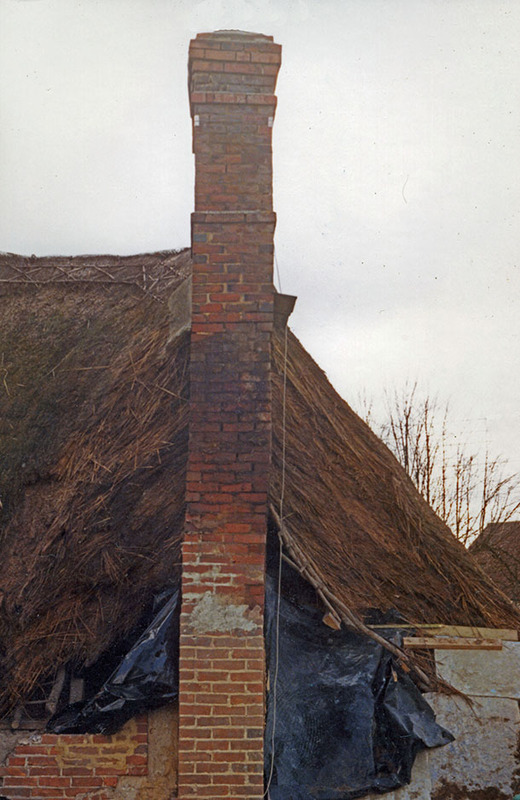 But involve stripping the roof down to the timbers and creating a thatch, with a flat angular appearance. But there is an alternative method. In the combed wheat reed areas, of the West Country, many thatchers adapted water reed, to the local rounded style. Here they fix the reeds, with thatching spars, to keep a multilayed roof… After a few years it is very difficult to tell the difference, between this type of roof, or the traditional combed wheat thatch. Complete with curves… This new thatch, in water reed, will fool even the experts in a few years. 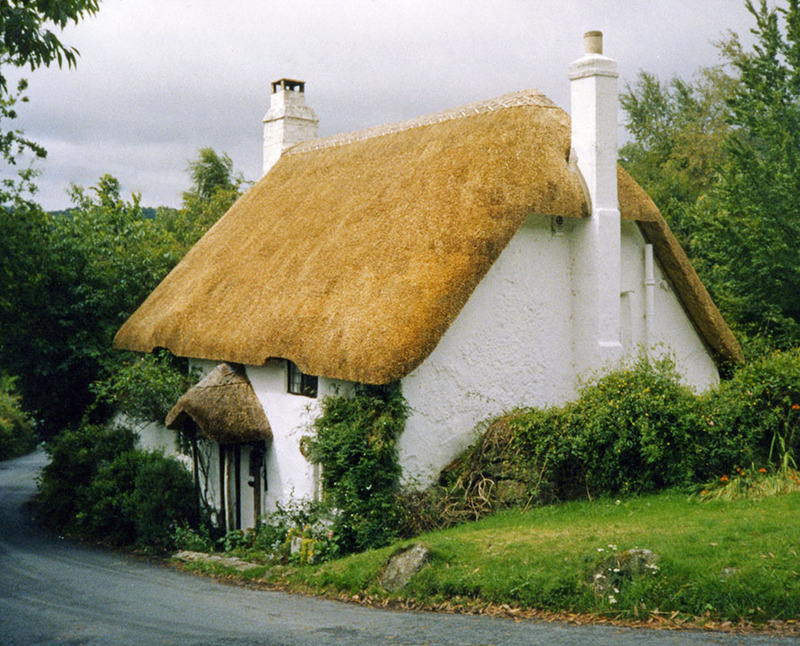 The local Devon shape has been retained, on this cottage at Lustleigh. 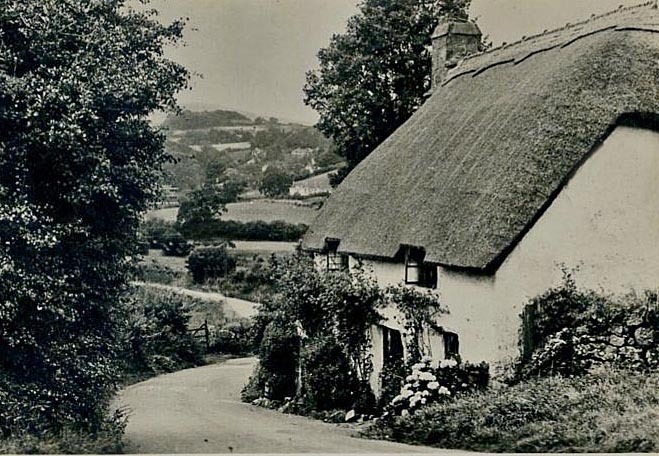 The lower image shows the same cottage thatched in combed wheat reed, in around 1955..
By retaining a multilayered roof, what are called the Historic Underlayers would also be preserved; making the conservation officer very happy. These are the previous coats of thatching, which can be as old as the property. Most Smoke Blackened Thatch, dates from the medieval period… These layers are almost like tree rings, recording the materials used and even the state of local agriculture, for centuries past. This has been described, as one of the best archaeological resources in Western Europe. I would suggest that any thatchowner considers all the options very carefully, before destroying this unique record of their property. Lots of layers… This roof at Winterborne Whitechurch, in Dorset, shows some rather thin roof timbers. And the record, of every coat of thatch laid on it, since it was constructed… Happily, all this is still preserved; under a coat of water reed; fixed down with thatching spars. Water reed, most certainly does have place in the craft of thatching. Large and new, suitably designed buildings, can look good in this material. With almost unlimited supplies, the sky’s the limit… This has allowed the trade to flourish. But past generations, have also left a legacy, which we should respect… And smaller, older buildings, generally suit the cereal straw thatching, they were designed for. 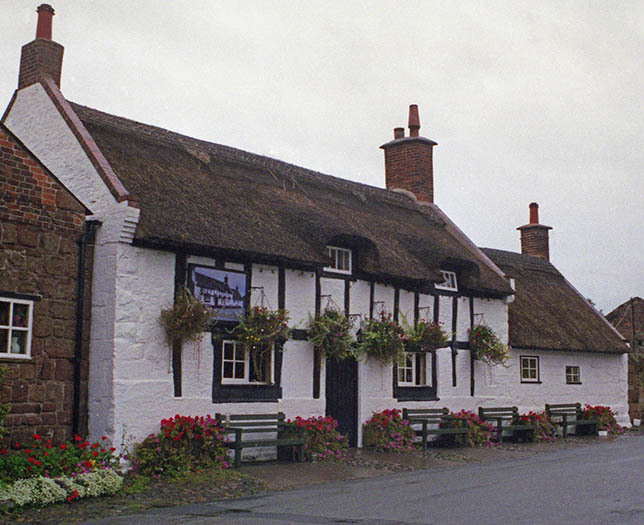 All types of thatching materials have a place in the trade… The trick is to use them wisely.